"Skin18 products feed natural ingredients and nutrition to your skin while makeup is considered as a coverage. A lady may not have perfect features but still look charming with beautiful skin, imagine a young girl with smaller eyes and a big nose but still look good at the age of 18. Founder of skin18 concerns about her skin the most and their mission is to bring you products which will make you look forever 18. It's the best to start skincare as early as possible but there is never too late just like having exercised for a healthy body." I received these facemask sheets from skin18 to review because I'm a part of their blogger program & I will keep on reviewing more & more stuff from skin18. It's a Korean brand and we all can't deny the fact the Korean girls have the best skin. I really recommend skin18 because they offer worldwide shipping and have affordable rates. They also offer you a list of currency to view, to make it easy for comparing the rates. 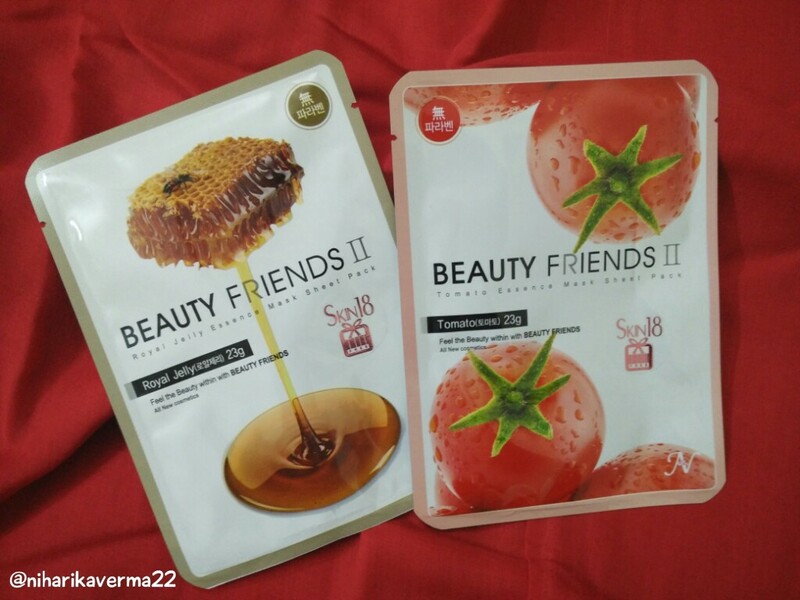 So I got Royal Jelly and Tomato Face Mask sheet. 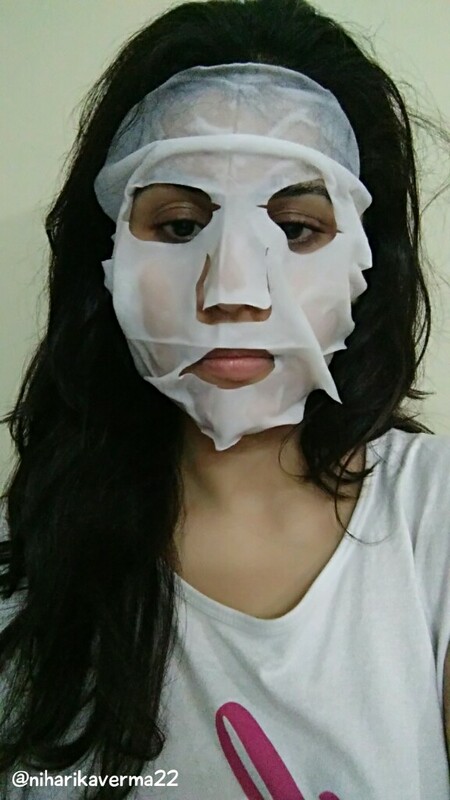 I really enjoy sheet mask because they are easy to use and no need to dip your fingers in mask tubs. Just grab a sheet, open it, place it over your face and relax. As these are Korean sheets, everything is written in the Korean language. The important parts such as little description, How to use & Ingredients are also in English. 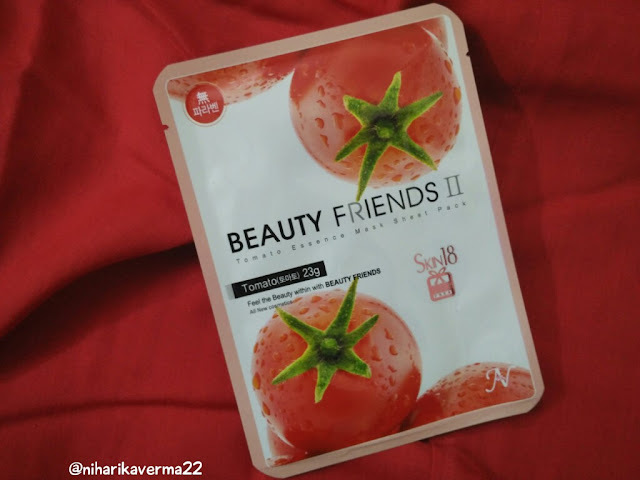 Tomato includes Solanum Lyco Persicum (Tomato) fruit extract that helps to make skin elastic and rejuvenated, prevents the formation of melanin while it cleans and moisturizes. It contains a large amount of vitamins and minerals which are known to be good for oily and blemish prone skin. 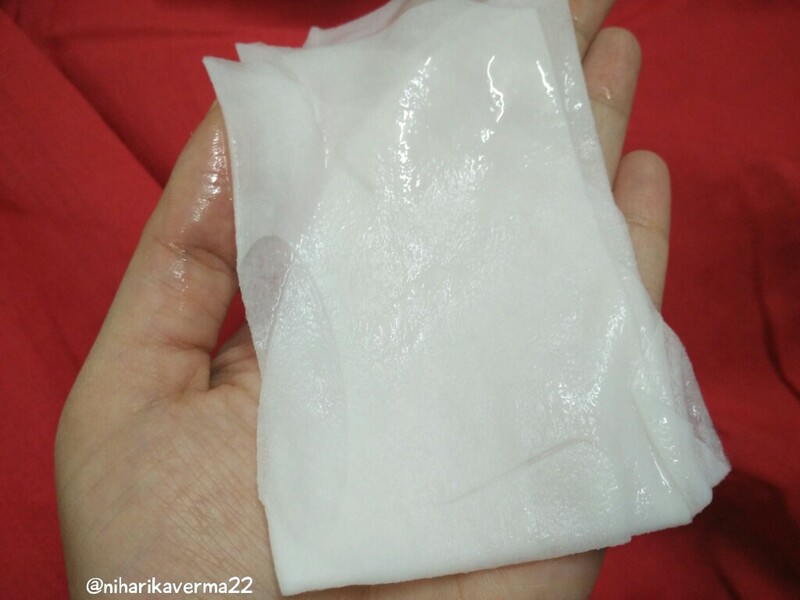 It helps to make skin more elastic and helps to remove excess oil and refine the pores. Rejuvenates your skin and helps prevent the formation of harmful substances. Simply wash your face and soothe your face with toner. You can use normal rose water as a toner too. Apply the sheet for 15-20 minutes and take it off. Rub the excess sebum on the face and let the skin absorb it completely. 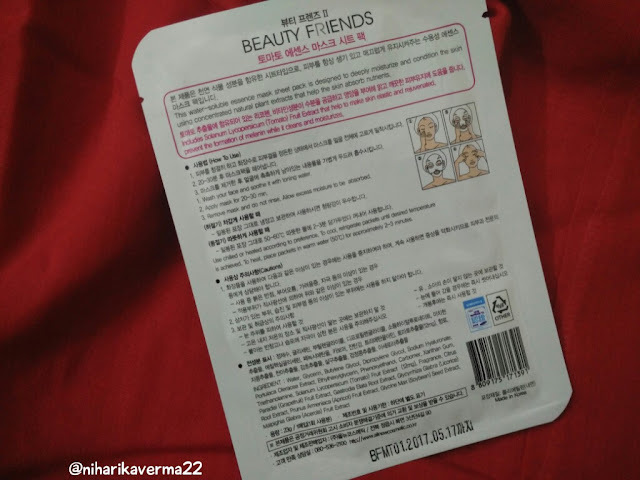 I have mentioned this number of times that I have oily and acne prone skin and I get really excited when I something for oily and acne prone skin. There is one sheet in a single pack. Sheets are heavily soaked in serum and there is no chance for you to say that sheets were dried up when you opened it. :D Completely satisfied with the serum quantity. You need to be very careful while opening the sheet as they are wet, so maybe there is a chance for minor tear. 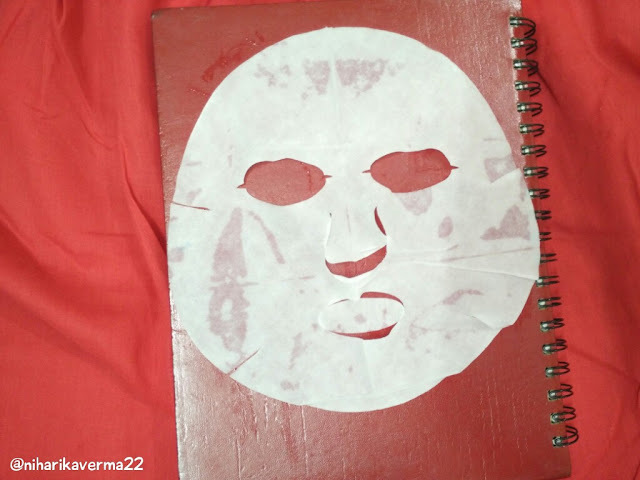 The sheet is designed in such a way, that it covers every face shape. For me, it was quite large. There are proper cuts to let the sheet fix on your cheekbones. It smells like a sour tomato or sour tomato soup. I didn't like the smell much. I know I'm looking funny! 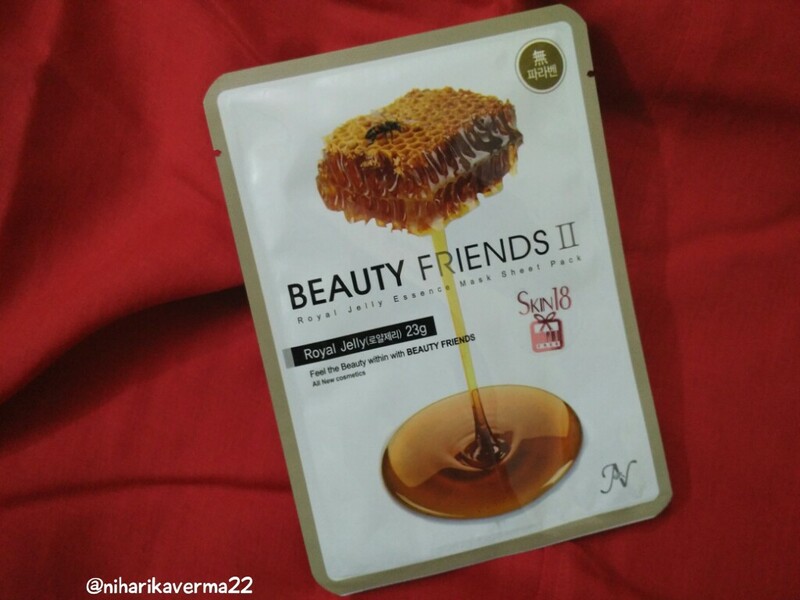 Royal jelly extract helps to soften the skin and it is excellent in helping to heighten your skin's moisture holding capacity. Helps skin looking healthy and elastic. It is concentrated form of honey. Royal jelly reduces fine lines and wrinkles. I wanted to try this on dry skin so gave it to my mommy who has really dry skin. This too didn't smells good. I read the ingredients and it was mentioned it contained extracts of apricot and soybean. So maybe because of all this mixture, it was not a quite good smell. But when it came to results! I was shocked! I mean in a positive way. My mommy has medium shade skin tone and it was clearly visible that the sheet worked. Her face was more bright and fair. Like she applied some kind of BB cream. It was like the glow and radiance we get after bleaching and facial. Her skin was really soft and supple for more than 5 hours. For me skin18 is now a magical brand. Go for it guys, you won't regret it later. There was no side effects or skin itchiness. Perfectly normal and a happy skin. Love it! I thought the jelly one would smell great for some reason but it sounds as if it works really well, which is the most important thing after all. This sounds like a product worth trying. haha you look rude with that mask ! Interesting though the tomato one! First time here, but now I'll be definitely coming back! Great job! These sheet masks sound really good.